Zun Lee offers an intimate view into the daily lives of Black fathers with whom he has worked closely since 2011--men from the Bronx, Harlem, and Washington Heights who are often parenting in difficult economic and personal circumstances. Lee brings into focus the narratives of these men as caretakers, interrogating and dispelling stereotypes of Black masculinity and absent fathers. Father Figure reveals the heart and pangs of not just Black men as fathers, but more broadly the implicit struggles of being Black in America. 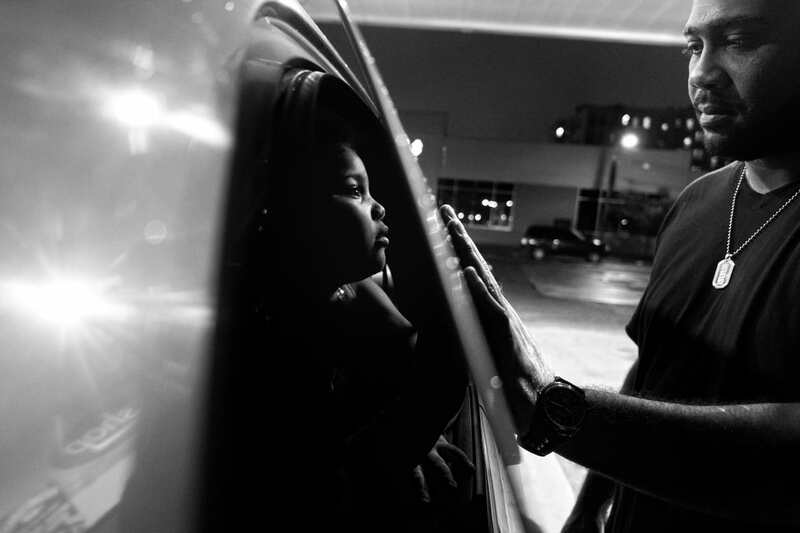 Media and political pundits often use the myth of missing Black fathers to explain away widespread social issues such as mass incarceration, income inequality, chronic unemployment, and gun violence, rather than to bring forth national dialogues around the complex consequences of structural racism. Lee’s work frames the struggle of men who feel this perpetual weight squarely on their shoulders, but who strive daily to give their children the fighting chance they never had. The photographer’s own experience of discovering his roots in the African American community subtly shines through in this work. Lee grew up with a father whom many would have considered “present,” but home was never where he felt physically or emotionally safe. An unexpected refuge came in the form of African American military families stationed in his hometown, Frankfurt am Main, Germany; from them he received what he didn’t at home: love, guidance, a sense of belonging and self-worth. This project allowed Lee to make sense of not only the world today but of his own memories, quietly rebelling against mainstream perceptions of what Black fatherhood supposedly looks like. Seven years after the inception of this immersive project, the work is returning to the community where it originated. Father Figure recognizes loving fathers rearing the next generation of Black children; in the photos there is an affection for life--an affection for Black life--for fatherhood and childhood. But most of all, this work allows the humanity of these families to breathe freely. Father Figure: Alternate Notions of Black Fatherhood is made possible by the National Endowment for the Arts, the New York State Council on the Arts with the support of Governor Andrew M. Cuomo, the New York State Legislature, by public funds from the New York City Department of Cultural Affairs in partnership with City Council, the Donnelly Foundation, and Ghetto Film School. Exhibition produced by Michael Kamber and Cynthia Rivera. Exhibition text by Olivia Adechi, Teju Cole, Bianca Farrow, Trymaine Lee, and Zun Lee.